Rain and wind expected tonight across PEI..
Precipitation.. Rain begins late this afternoon ending near noon tomorrow giving 15 mms. Dry Tuesday afternoon through Wednesday afternoon. Rain begins again Wednesday afternoon changes to flurries by dawn Thursday. Flurries, snow pellets, ice pellets continue into early Friday morning especially down east. Dry Friday into early Saturday. Showers begin Saturday afternoon and continue through Sunday possibly changing to flurries on Monday. Temperatures.. At or above normal today through Wednesday. Cold Thursday and Friday, above normal again on Saturday, normal on Sunday, cool on Monday. Wind.. Light westerlies today will shift to SW this evening then increase to brisk-strong after midnight tonight then shift to westerly near dawn on Thursday. These brisk-strong westerlies will then slowly diminish through the day shifting back to light-brisk SW for Wednesday. Cold NW winds on Thursday and Friday. Hazards.. Wet driving conditions in rain developing later this afternoon. Bridge restrictions are expected beginning late this evening and continuing through at least noon on Tuesday. Strong gusty southerly winds developing by midnight tonight shifting to westerly tomorrow morning. Trees are still full of foliage which may cause some power issues. Watches/warnings.. Wind warning has been issued for all of PEI. Tonight.. Showers becoming periods of rain, winds increasing to brisk-strong SW, temps rising to 15 by dawn. Tomorrow.. Showers, brisk-strong SW winds at dawn. 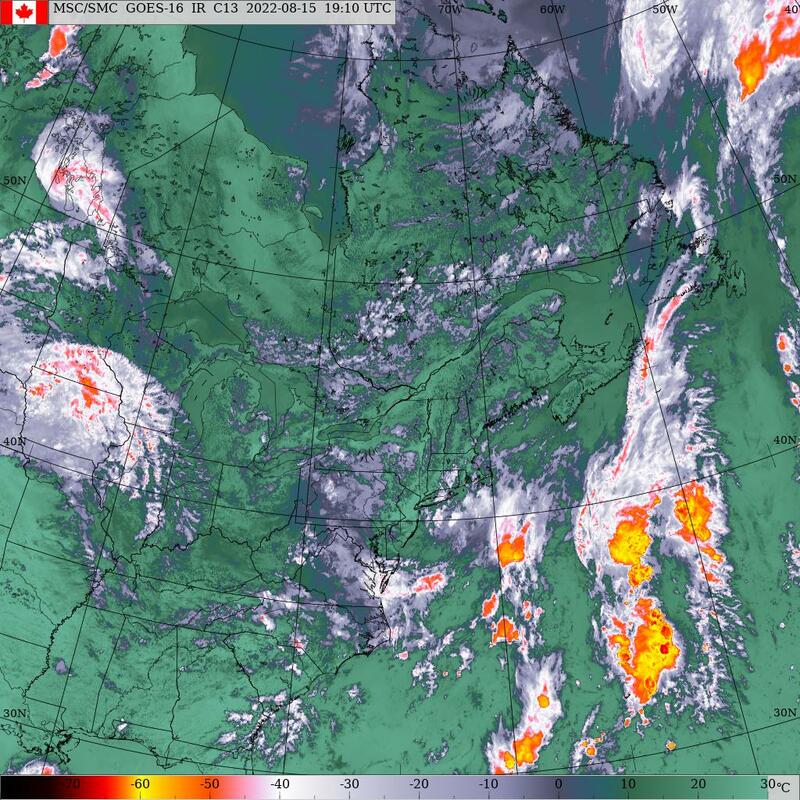 Winds shift to the W-NW, showers end then clearing by noon, Highs 15c at dawn then fall to 10 by noon then steady.